How to Make a 3-D Drop-In Card! 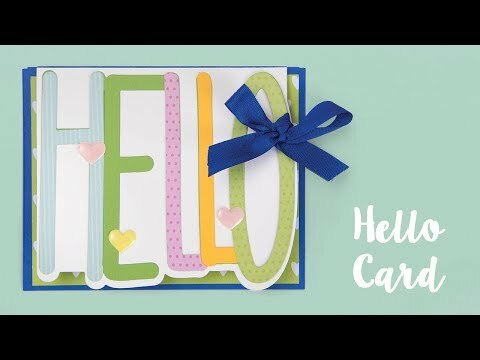 How to Make a Hello Greeting Card! How to Make this Happy Anniversary Card! Did You Know? Every Crafter Needs This Stamper's Secret Weapon! https://www.sizzix.com/catalogsearch/result/?q=secret+weapon Stephanie Barnard is here with a Did You Know? tip! Get the perfect stamp every time with these secret weapons in your crafting arsenal! https://www.sizzixlatinoamerica.com/662737/sizzix-framelits-die-set-4pk-flower-fold-its Diga hola con esta tarjeta de flores súper linda de Stephanie Barnard. La artista de Sizzix Deena Ziegler lo guía a través de 6 pasos en 60 segundos para mostrar lo fácil que es hacer algo espectacular. ¡Tómate un minuto para hacer que el día de alguien sea especial! 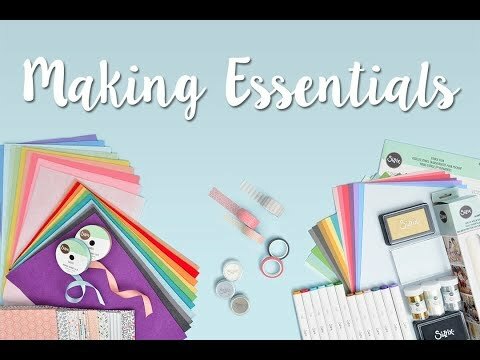 For the English Version: https://youtu.be/YjuR9Tc_cu4 About Sizzix: In 1977, Ellison, the parent company of Sizzix, invented the first consumer hand-operated die-cutting machine to cut a wide variety of materials. Since then, we've led the DIY movement with imaginative solutions for every creative lifestyle. As one of the DIY market's most requested brands, we continue to develop award-winning products with unsurpassed quality to empower expression in all. We invite each and every individual to explore their artistic potential through our family of die-cutting and embossing machines that produce thousands of diverse designs to suit any style. From scrapbooking, cardmaking and papercrafting to fashion, quilting and home décor, we provide people of all ages and abilities the opportunity to express themselves in countless new ways. 6 Steps With Sizzix in 60 Seconds: Star Wands! https://www.sizzix.com/18579/star-wands You’re a star! Make a fun shape to complete these whimsical wands and set your art galaxies apart with designs from Stephanie Barnard. About Stephanie: If it's possible to live, breathe, eat and sleep scrapbooking and stamping, Sizzix spokesperson Stephanie Barnard is giving it her best shot. Besides owning her own clear stamp company, The Stamps of Life, she offers our research and development team invaluable insights into new products, and is a licensed designer and the inspiration behind her own Sizzix line. In addition, she is a sought-after teacher and demonstrator and has been featured on numerous television shows, books, magazines and websites. About Sizzix: In 1977, Ellison, the parent company of Sizzix, invented the first consumer hand-operated die-cutting machine to cut a wide variety of materials. Since then, we've led the DIY movement with imaginative solutions for every creative lifestyle. As one of the DIY market's most requested brands, we continue to develop award-winning products with unsurpassed quality to empower expression in all. We invite each and every individual to explore their artistic potential through our family of die-cutting and embossing machines that produce thousands of diverse designs to suit any style. From scrapbooking, cardmaking and papercrafting to fashion, quilting and home décor, we provide people of all ages and abilities the opportunity to express themselves in countless new ways. Get Making With NEW Cards That Wow by Stephanie Barnard! https://www.sizzix.com/catalog?cat=1538 Are you ready for more cards that wow? 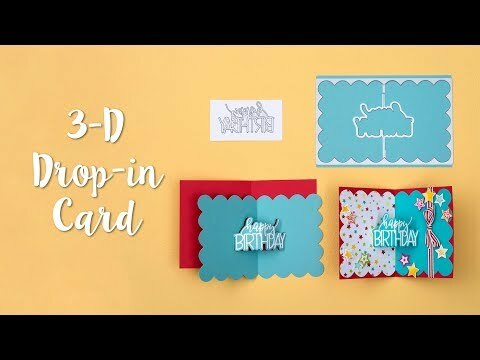 Check out this latest release from Stephanie Barnard, including her newest on-the-fold cards in fun new styles, as well as a Generic Drop-ins die to turn any shape into a pop-up with any 3-D Drop-ins card base. About Stephanie: If it's possible to live, breathe, eat and sleep scrapbooking and stamping, Sizzix spokesperson Stephanie Barnard is giving it her best shot. Besides owning her own clear stamp company, The Stamps of Life, she offers our research and development team invaluable insights into new products, and is a licensed designer and the inspiration behind her own Sizzix line. In addition, she is a sought-after teacher and demonstrator and has been featured on numerous television shows, books, magazines and websites. About Sizzix: In 1977, Ellison, the parent company of Sizzix, invented the first consumer hand-operated die-cutting machine to cut a wide variety of materials. Since then, we've led the DIY movement with imaginative solutions for every creative lifestyle. As one of the DIY market's most requested brands, we continue to develop award-winning products with unsurpassed quality to empower expression in all. We invite each and every individual to explore their artistic potential through our family of die-cutting and embossing machines that produce thousands of diverse designs to suit any style. From scrapbooking, cardmaking and papercrafting to fashion, quilting and home décor, we provide people of all ages and abilities the opportunity to express themselves in countless new ways. 6 Steps With Sizzix In 60 Seconds: Flower Fold-its Card! https://www.sizzix.com/18572/hey-flower-fold-its-card Creativity is in full bloom! With this fun, Fold-its card you can make a lovely layered shape to ring in spring or make any day blossom beautifully! About Stephanie: If it's possible to live, breathe, eat and sleep scrapbooking and stamping, Sizzix spokesperson Stephanie Barnard is giving it her best shot. Besides owning her own clear stamp company, The Stamps of Life, she offers our research and development team invaluable insights into new products, and is a licensed designer and the inspiration behind her own Sizzix line. In addition, she is a sought-after teacher and demonstrator and has been featured on numerous television shows, books, magazines and websites. About Sizzix: In 1977, Ellison, the parent company of Sizzix, invented the first consumer hand-operated die-cutting machine to cut a wide variety of materials. Since then, we've led the DIY movement with imaginative solutions for every creative lifestyle. As one of the DIY market's most requested brands, we continue to develop award-winning products with unsurpassed quality to empower expression in all. We invite each and every individual to explore their artistic potential through our family of die-cutting and embossing machines that produce thousands of diverse designs to suit any style. From scrapbooking, cardmaking and papercrafting to fashion, quilting and home décor, we provide people of all ages and abilities the opportunity to express themselves in countless new ways. https://www.sizzix.com/18474/happy-birthday-edgelits-gatefold-card Six easy steps on how to create this wonderful Happy Birthday Edgelits Gatefold Card using Stephanie Barnard's new Edgelits die! Coming with brackets, bevels, and lace, let this die set to give your papercrafting a new edge. Watch our tutorial for how to use this die pack to make an easy card in six steps! About Stephanie: If it's possible to live, breathe, eat and sleep scrapbooking and stamping, Sizzix spokesperson Stephanie Barnard is giving it her best shot. Besides owning her own clear stamp company, The Stamps of Life, she offers our research and development team invaluable insights into new products, and is a licensed designer and the inspiration behind her own Sizzix line. In addition, she is a sought-after teacher and demonstrator and has been featured on numerous television shows, books, magazines and websites. About Sizzix: In 1977, Ellison, the parent company of Sizzix, invented the first consumer hand-operated die-cutting machine to cut a wide variety of materials. Since then, we've led the DIY movement with imaginative solutions for every creative lifestyle. As one of the DIY market's most requested brands, we continue to develop award-winning products with unsurpassed quality to empower expression in all. We invite each and every individual to explore their artistic potential through our family of die-cutting and embossing machines that produce thousands of diverse designs to suit any style. From scrapbooking, cardmaking and papercrafting to fashion, quilting and home décor, we provide people of all ages and abilities the opportunity to express themselves in countless new ways.